You won't be forced into a heterosexual romance. 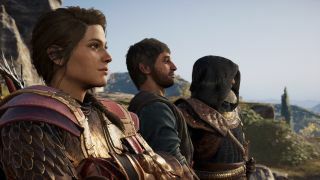 Assassin's Creed Odyssey's new update is out today, tempting players back to Greece with a New Game Plus mode where you'll be able to start Alexios or Kassandra's adventures again. Tweaks have been made to the Shadow Heritage DLC, as well, which previously locked players into a heterosexual relationship despite their earlier romantic decisions. New Game Plus mode will become available when you complete the main quest, hurling you back in time to Kephallonia. You'll be able to keep all the excellent stuff you've already earned, of course. Gear, mounts, spear upgrades, ship upgrades, abilities, drachmae, crafting materials and more will be retained. This is normally where I might consider kicking the difficulty up a notch, but Odyssey's not one of those games I've felt really benefits from tougher fights. Enemies are damage sponges rather than devious adversaries. Not that I have time for a second outing. It's already massive! I commend anyone brave enough to risk getting sucked in again. Back in January, facing criticism for forcing players into a heterosexual romance in the Shadow Heritage DLC, Ubisoft said it would be changing dialogue and a cutscene "to better reflect the nature of the relationship for players selecting a non-romantic storyline." You'll be able to see that change today, though the patch notes are vague about what those changes entail. It's also not clear if players who have already played Shadow Heritage will be able to go back and make a non-romantic choice. The update also adds new frames for your photos, accessibility improvements, balancing and bug fixes. It's out today, and you can check out the patch notes here.